Everybody like me(in early),don’t know why Forex market move .In broadly say we maximum don’t think or not to think why Forex market move. But you must know about this.When you go to in any market what you think? You must know why you go to market and which product you want to buy.Also you know which market to go,you get your product.So it must know why Forex market move & Question yourself HOW,WHY and When FOREX move. By find out this question i get some fantastic knowledgeable story in different manner. Lets go to know about this. You see in this diagram, Technical trading has its place in Forex Trading. But it is just preposterous to assume that was all there is to trading. 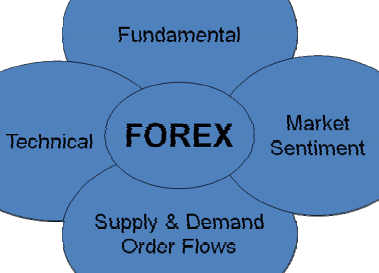 In order to trade Forex successfully, you need to learn Technical, Fundamentals, Order Flow and Supply & Demand, and of course, Market Sentiment. Before you get intimidated, let me just say that you don’t need a degree in economics or spend hours per day perusing through news releases. All you need to know are some basic principles and what news releases to watch out for, then prepare for a couple hours a week looking at the market, preferably on Sunday afternoon before the market opens, and then you are pretty much set for the entire week. 1. Why does the Forex Market move? 2. How does the Forex Market move? 3. When does the Forex Market move? Let’s try to answer each question individually in the next chapter 2 . Although they might not be related directly with Fundamental trading, but without having proper understanding of the big picture,fundamental trading would just be another piece of the puzzle that we can’t put together. Thanks for real view.You wrote my real factor.Hope you will be continue by this topics.